Our family is absolutely, without a doubt, 100% called to public school. Unless God speaks very clearly that we are supposed to do something else, I see my children in the public education system for the long haul. And despite the “sky is falling” mentality that has covered our nation when it comes to education, I couldn’t me more thrilled and excited to send my children out into the world where they will learn (at times the hard way) both academic and life lessons. Maybe you, too, know your family is called to public school. Perhaps you’ve been called to homeschool or to a local private school. No matter what means of education God chooses for our family, there will be ups and downs; challenges and triumphs. It’s important for every parent to intentionally guide their child through the years of academia as a positive model of how to thrive on the road we’ve been called to walk. My heart is passionate about public school because I know we are called to it and because I see the so much negativity from those who are weary of the system. I get it, I truly do. But I want to keep a positive outlook and help my children do the same as they bring light and hope into the halls of their schools. I want my kids to win every battle they will encounter on their educational journey. I want them to thrive, even when circumstances are less than ideal. I want them to enjoy their experience, even if it isn’t perfect (and it won’t be). But all these hopes and dreams for my children in regards to their education won’t mean a thing if I am unsure of the path God’s called us to or if I complain as we walk together. 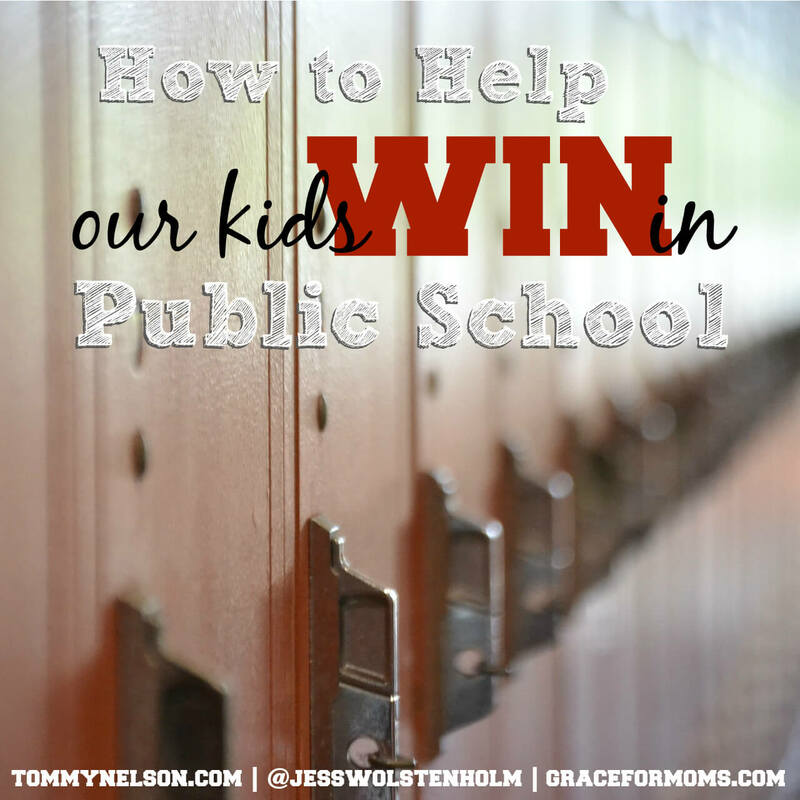 My husband and I are committed to help our kids win in public school. We won’t be perfect but we will try, by God’s grace, to intentionally choose our attitudes and responses to every high and low we encounter as we guide our kids through their school experience. 1. POSITIVITY. Staying positive and teaching our kids to do the same. This may be hard at times, but we’ll do our best to keep a good attitude and use life-filled words as we talk about school and education. 2. REALITY. Reminding them that some things in life are hard but they don’t have to face them alone. Tough teacher? Difficult test (even those terrible standardized ones)? Run-in with a mean classmate? We’ll face each situation together, understanding that bumps in the road of life teach us to lean into God and each other. 3. RESPECT. Modeling respect with words and actions towards teachers and friends. Our children will reflect our attitude towards others which makes it even more important to choose positive words and careful reactions to tough situations. 4. GRATITUDE. Verbally expressing thanks for the opportunity to learn, the resources available and the people who have given their lives to education. We don’t want our kids to feel entitled to a perfect education. We will be thankful for what we have and trust God to use it for our good. 5. HOPE. Offering hope for the future of their education and their dreams. While I’m sure there is much more going on behind the scenes than we will ever know, we’ll choose to look towards the future with hopeful expectation. Thank you for the gift of education. Thank you for the opportunity to be your light in the midst of our little corner of the world. May our children feel your great love surrounding them as they learn, play and grow in school. When we encounter a tough situation with a teacher, classmate, assignment or test, give us wisdom to respond with grace and respect. Guide us along our journey each and every day. We thank you for the amazing teachers and staff who serve us daily. Bless them beyond measure for their willingness to give their lives for our children. May we honor you and everyone we come in contact with this year. In Jesus’ name, amen. Is your family called to public school? No matter what method of education your family follows, in what ways are you committed to helping your children win in education? This entry was posted in Blog, Tommy Nelson and tagged Back to School, Education, Parenting, Public School, School by Jessica Wolstenholm. Bookmark the permalink.